Ongoing negotiations between the Congolese government and the political wing of the rebel National Congress for People's Defense (CNDP) ends today (Friday) in the restive North Kivu province of Goma. This follows a recent peace deal to end the long time hostilities between the national army and the rebels which has left scores dead and a sharp increase in the internally displaced persons. The rebels also agreed to be integrated into the national army as well as immunity from prosecution for rebel commanders. But President Joseph Kabila's government is coming under enormous international pressure to hand over rebel leader Bosco Ntaganda to the International Criminal Court. Albert Kambale is a Congolese journalist in Goma. He tells reporter Peter Clottey that most Congolese are questioning the rationale of the negotiations after the rebels decided to join the national army. "The talks between the rebels and the Congolese government are going to end today (Friday). The talks come after the rebels have integrated into the national army and all we are asking is why are the talks continuing in Goma when the original problems seem to have ended? What was problematic was that as far as the CNDP rebels accepted to be integrated into the national army it was not important for the political talks to continue," Kambale said. He said most Congolese are against the ongoing political talks reportedly aimed at some sort of a power sharing agreement between the rebels and the government. "Some Congolese are asking whether the talks are aimed to share power or political responsibility. The population is saying if this is what is going on then it would encourage a lot of rebellion or rebels in the country and everybody doing what they want. So that in the future you would come back and ask for negotiations and share power with the government," he said. 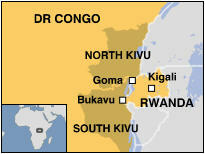 Kambale sharply differed that the talks were necessary for peace in the restive north Kivu province. "I cannot say that the talks were important since Bosco Ntaganda (former CNDP rebel) decided to join the national army with all the combatants of his rebellion then the talks should have ended. So, talks would have been important if fight between the government and the rebel continues, but sine the fight had stopped and the rebels willingly accepted to be integrated into the national army, I don't think the talks were longer important as before," Kambale pointed out. He said there are strong indications that Kinshasa would not hand the rebel leader to the International Criminal Court in The Hague for alleged war crimes. "This is impossible because up to now I don't think the government would just give Bosco Ntaganda to the International Criminal Court simply because he is the one who brought peace and he is the one who decided on the breakaway faction of the CNDP to say let's join the national army. So, at the moment and even in years to come, I don't think that the government is going to deliver him to the court. And at the moment he is being used by the government in the joint military operation against the FDLRA (Democratic Forces for the Liberation of Rwanda) in the east of the Democratic republic of Congo," he said. Some political analysts say the demand by rebel soldiers to join the ranks of the national army after the agreement with the government was assigned shows how the need to end the war has been long overdue. Meanwhile, both local and international human rights groups are demanding Kinshasa hand over former rebel leader Bosco Ntaganda to the International Criminal Court. Based in The Hague, the ICC issued an arrest warrant for Ntaganda for his alleged role in war crimes, particularly enlisting child soldiers in 2002-2003 in the country's northeastern Ituri region, Ntaganda's defection dealt a massive blow to one of Kinshasa's toughest adversaries in the eastern Kivu provinces, renegade general Laurent Nkunda, who was arrested in neighboring Rwanda on January 22.